There have only been a few franchises that have soaked up as much of my time as Gears of War has over the last five years. Once I took a chainsaw to the face of my first unsuspecting locust grub I was hooked. Gears of War was a masterpiece, especially the story. Gears of War 2 took a little too much creative liberty with the plot for some people, but was still an amazing game and the addition of Horde mode, which has been copied by numerous other games since, certainly didn’t hurt it. Now Epic Games is back with the finale of the Gears of War trilogy and hoping to send out Delta Squad with a huge curb stomp to the face. 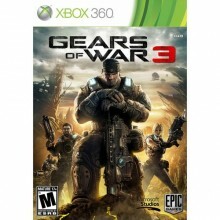 Gears of War 3 is set two years after the sinking of humanities last strong hold – Jacinto. Desperation has set in for Delta Squad and the rest of humanity as the locust and newly mutated lambent still fight for survival. As the game starts out you’re on a modified air craft carrier that is essentially the only place for people to live now. As you wake up, you’re instructed to find the rest of Delta Squad and brave the mainland for supplies. You’re partner and best friend – Dominic Santiago – is still reeling from the loss of his wife Maria and doesn’t really have the will to fight any more. Soon you’re introduced to new characters Samantha Byrne and Jace Stratton, the latter was heard in Gears 2, but never actually seen. You’ll also hear from series familiars Damon Baird, Augustus “Cole Train” Cole and Anya Stroud, who has transformed from a simple operations specialist into another soldier in Delta. As you prepare to leave the ship, it’s attacked by the lambent, namely polyps (little exploding spiders), Drudges and other various lambent mutants. This is your first true taste of what is in store for you in the game. The first few levels of the game revolve around the lambent, and then it shifts to the locust and then a huge mixture of the two. While there are now eight members in Delta Squad (up from four in the previous two Gears installments) you always conveniently split up in teams of four (perfect for the newly integrated four player co-op). Over the course of the game you’ll discover that Adam Fenix is still alive and Marcus will do anything he can do find his father and stop the locust. There will be some major ups and downs for Delta Squad, loss and pain and an eventual light at the end of the tunnel. When Epic announced that they were delaying Gears 3 from its original release date in April to September fans were floored, but it’s amazing the amount of polish they were able to put on every aspect of the game from the campaign, to horde and beast mode to the standard onslaught of multiplayer modes. Gears of War and Halo have always been the only franchises where I’ve actually spent extensive amounts of time participating in multiplayer. I unfortunately never got to play Gears 1 over XBL so my first foray into true Gears of War multiplayer was spending hours upon hours playing horde in Gears 2, which I was severely addicted to. So needless to say after playing a like 20 matches of the various Gears multiplayer modes I retired to campaign co-op and horde/beast modes. For those who aren’t familiar with horde, it’s essentially you and five friends fighting off fifty waves of locust and lambent enemies with each wave getting progressively more difficult and a boss wave every tenth wave. Epic added two great additions to make horde that much more addictive. The first is the ability to mark enemies, which is great for intense firefights, having the ability to mark an incoming Boomer or Grinder is great. The other, and by far the biggest, is the addition of fortifications. You’ve got many different fortifications including fences, turrets, sentry guns, decoys and the prize possession – the Silverback. Each fortification has various levels you can upgrade. For example, when you start building turrets, you start off with ones that hold four or five hammerburst rifles, which are horribly inaccurate. After you put enough money into them (which takes many, many games to do) you can upgrade to lancer rifle turrets and eventually to troika turrets. At the beginning of each game you start off with $1,000 you can spend on fortifications or ammo (or save up) and you earn money for completing objectives like chainsawing X enemies in a round, killing ten enemies in a thirty second window, etc and just killing enemies in general. Horde is by far the best multiplayer mode in the game. The new addition to multiplayer is Beast mode. Beast is similar to Horde but instead of fighting the locust, you are the locust. You have to beat twelve rounds of COG soldiers. They have four tiers of locust you can choose from, but it’s not as simple as just picking a berserker from the start. For the first few levels you’ll only be able to choose from: Wild Tickers, exploding Tickers, Wretches, Savage Drones or Butchers. Once you earn enough through killing opponents or destroying their fortifications you’ll eventually unlock the next tier, which includes everything from Kantus Priests to Maulers, Bloodmounts, Berserkers and Boomers. Sadly, the game is far too easy compared to Horde and takes little effort or strategy to beat the full twelve waves, but it’s still a great amount of fun. I was afraid that my expectations of what Gears of War 3 might be would ruin what it actually was, but that was not the case. In fact, Gears of War 3 exceeded my expectations more than I thought it could. The campaign is fantastic, especially with the integration of four-player co-op, the multiplayer is balanced and Horde/Beast modes compliment each other well and will leave gamers playing for months to come. While the Gears of War franchise as we know it has come to an end, I can’t wait to see what Epic brings us in the future. I’m personally hoping that we get some sort of prequel like what the Halo franchise did last year with Halo: Reach. Gears 3 DLC, dated for release in December, will slightly touch on the events that transpired before the events of Gears 1, but I’m hoping for something that focuses more on the events from E-Day to the events of Gears 1. Either way, I know it’s not the last we’ll see of Gears of War and certainly not the last we’ll see of Epic, and I couldn’t be happier about both.